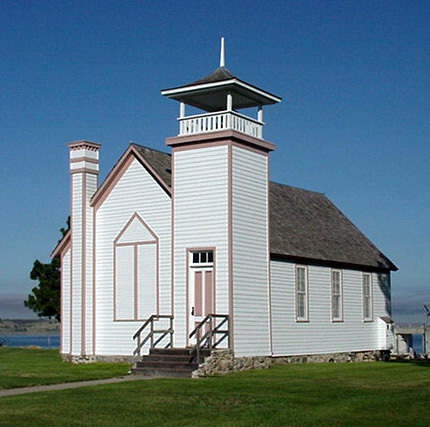 Sunday morning services at the historic Oahe Chapel overlooking Lake Oahe north of Pierre will begin on May 29. Public ecumenical services are held at 8 a.m. CDT each Sunday through Labor Day. Visitors to the area, as well as local residents, are invited to attend. The chapel is located adjacent to the U.S. Army Corps of Engineers Visitor Center, approximately five miles north of Pierre on SD Highway 1804. Services are hosted by the Pierre-Fort Pierre Ministerial Association and the Oahe Chapel Preservation Society. The Oahe Mission was established in 1874 by Rev. Thomas L. Riggs, a Congregationalist minister, and his first wife, Cornelia Margaret “Nina” Foster, to serve as a mission to the Sioux Indians of central South Dakota. The chapel, built in 1877, was originally located on the east bank of the Missouri River at Peoria Flats, roughly five miles upriver from its current location. It was moved to its current location in 1964 after construction of the Oahe Dam flooded the original site. The chapel is owned by the South Dakota State Historical Society and managed by the Oahe Chapel Preservation Society, which oversees its maintenance and preservation. For more information on the Oahe Chapel summer services, the Oahe Chapel Preservation Society, or how to rent the chapel, contact the State Historical Society at (605) 773-3458.